2017 Top 50 True Freshman DB’s and their Impact on the season. 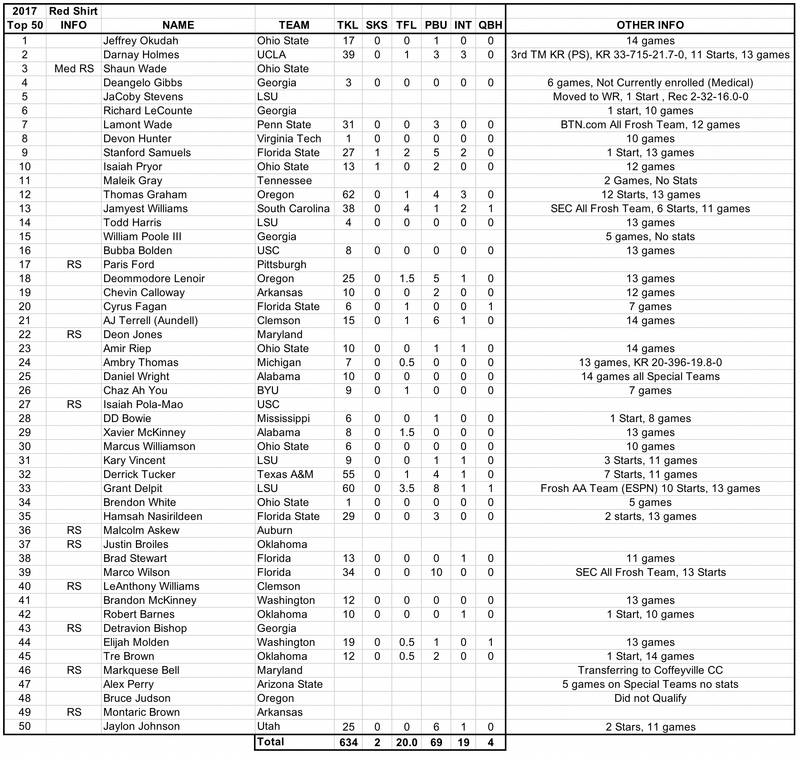 Here is the final list talking about the Top 50 true freshman defensive backs and their impact on the season. I intended to have this out back at the end of March but was overlooked. One team stood out on this list being Ohio St. The Buckeyes have 6 players (2 Top 10) listed and 5 of them had significant playing time. Out of the Top 50 True Freshman on this list, 39 (78%) contributed in some way this past season. Of the 39 players with stats, 9 were from my Top 10. 1 player moved to WR PS#5 Jacoby Stevens of LSU 1 start played in 6 games with 2 receptions for 32 yards. Three players on this list had over 55 tackles. PS#12 Thomas Graham of Oregon led the group with 62 tackles. In 2nd was PS#33 Grant Delpit from LSU with 60 tackles. 3rd came PS#32 Derrick Tucker of Texas A&M with 55. Only two players recorded a sack on the list PS#9 Stanford Samuels of Florida St and PS#10 Isaiah Pryor of Ohio St.
One player that really stands out on this list is PS#2 Darnay Holmes of UCLA. Not only did he start in 11 games had 39 tackles and 3 interceptions he had 33 kick returns for 715 yards 21.7 avg and 3rd team PAC-12 KR honors (PS). Overall the Top 50 true freshman DB’s contributed 634 tackles, 69 PBU’s and 19 interceptions this past season. Top 50 true freshman DB’s for 2018.